Ken Roczen was, by no direct fault of his own, the absolute star of professional motocross from his dominant run in the 2016 Outdoor campaign all the way through the offseason. The German Phenom had a pretty poor stretch that went back to his switch from KTM to the RCH unit. After winning the outdoor title in 2014 in his debut season with the big boys, Roczen experienced a myriad of troubles acclimating to the new team. From injuries, to setup issues (may sound like an excuse to some, but it’s impossible to overstate the importance of bike setup at this level of the sport), the prodigal rider took about a year and a half until he reemerged as the one to beat at the highest level of professional motocross. In 2016, Roczen started to gain more confidence on the yellow machine in the Supercross series, however he was never able to mount much of a threat towards Dungey’s 3rd title. When the outdoor season came around, we witnessed someone who had simply decided it was their time to dominate. The young German was untouchable for nearly every moto of the year, finishing just 16 points short of the 4th perfect season in the history of motocross. After his dominant run, in which he claimed his 2nd title in the premier class in just his 3rd attempt, Roczen surprised the motocross world with a megadeal that made him the new face of HRC Honda’s factory effort. The Japanese head honchos clearly held high hopes for their World War 2 ally’s pride & joy, Kenny boy. The offseason, as I’m sure any tepid motocross follower is aware of, was filled with hype. Shortly after Roczen signed with his new squad, and with limited time on the new digs, he went 2-3 on moto wins at Monster Energy Cup. Expectations couldn’t have been higher for the young immigrant coming into the 2017 Supercross season. With Anaheim 1 just days away, Roczen made a bold statement showing up to press day in a full three piece. To our memory, there hasn’t been a time when a racer has deviated from the sponsor-laden button-ups we’ve become so accustomed to. Of course, everyone and their mom had an opinion on the gesture, but Roczen was ready for the spotlight. The night before the gate drop, Moto-X Lab debuted their new line of innovative gear; and guess whose name dawned the back? You guessed it. Never one to shy from pressure, Roczen more than delivered at the season’s anticipated season opener. As he cruised away from Dungey in the heat, then followed up with an utterly dominant performance in the main: leaving the likes of Dungey, Musquin & Anderson nearly a half lap behind him. K-Roc was able to follow up his impressive season debut, with an equally impressive San Diego performance. He went out & claimed the first heat in convincing fashion. In the main event, Kenny got out to a great start. He hounded Dungey for a handful of laps, and in one of the more assertive passes you will see, ripped around one of the few Target-sponsored athletes in the world with relative ease. Coming in to Anaheim 2, it was clear that this championship was going to come down to the former teammates and training partners. Roczen was able to capture his 3rd heat race win in a row, while Dungey was barely able to sneak into the main through the semis. The main opened up in a way that Roczen clearly wasn’t used to, as he was forced to make his way through the pack with a poor start. The German was able to make his way to the rear tire of 2nd place & his current teammate, Cole Seely, with surgeon-like precision. He seemed patient & calm as he followed Seely around, looking for an opening. Just as the race had settled, Roczen was abruptly ejected from his Factory Honda machine. The crash was as scary as Zach Bell’s from a few years ago, as he was in absolute free-fall to the hard surface of Anaheim. 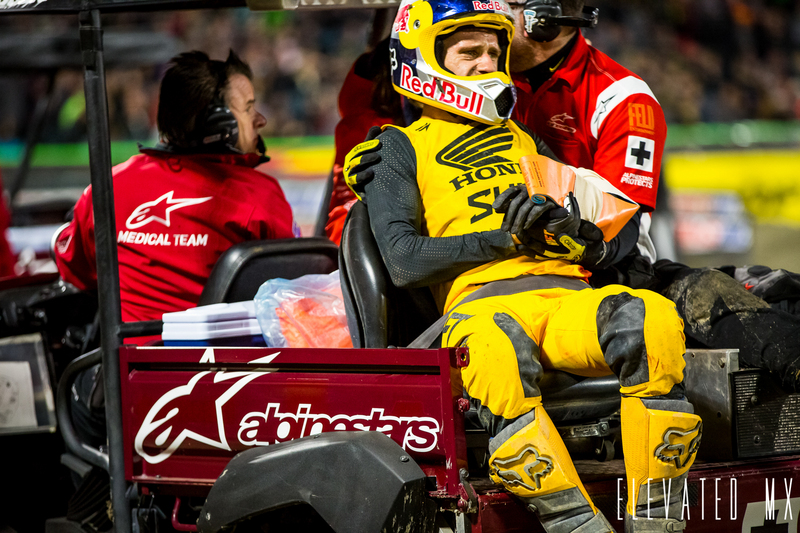 As of right now, it appears that the much-hyped Supercross camapign of Ken Roczen has come to an end, as he suffered a compound fracture to his arm. Many could speculate that the pressure that was piled on to the German prodigy could have led to his nasty crash, but really, motocross is a nasty sport that can come up & bite you, regardless of circumstances. The only thing we know for certain right now is this; he will be back, and he will be out for blood. Because that’s what champions do. Get well soon, Kenny.